Previously, the automated Workload Rejected and Workload Reminder e-mail messages that are sent to faculty members contained the term “Workload.” This term has been replaced with a variable based on the Faculty Input Form Title used by your institution. When sorting the contents within a table, the sort behavior is now case insensitive – upper/lower case and initials caps are no longer a consideration in how the content is sorted and displayed in a table. Previously, table sorting was case sensitive. 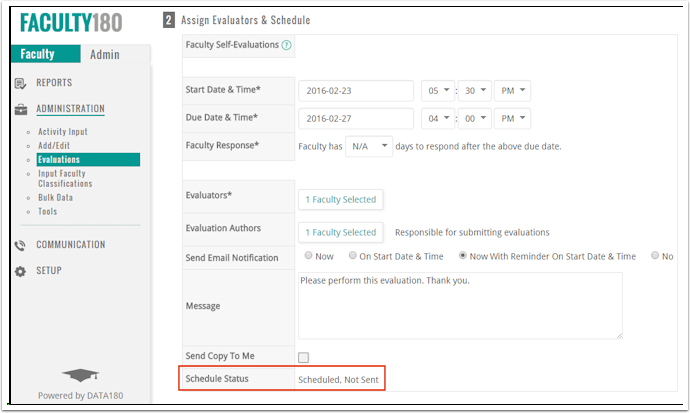 If an email notification is scheduled to be sent for an evaluation, the Evaluation Form (Assign Evaluators & Schedule section) now displays the schedule status of the email notification. The status will show if an email notification has been scheduled for the evaluation, and if so, whether the email notification has been sent or not. The evaluation must be saved for the email notification status to display. In the Assign Evaluators & Schedule section, the Schedule Status field displays the email notification if one is scheduled. If a new evaluation was created, the evaluation must be saved before the Schedule Status field displays. The Term Designation drop-down and Unit Designations in the Setup – Details screen are now only available to DATA180 administrators at your institution. This help prevents changes from being made to your institution’s FACULTY180 configuration, which could have an extensive impact on your institution’s FACULTY180 environment. If a FACULTY180 user has administrative rights for more than one unit, the user can now easily toggle between units. To toggle between units, click the Log Off arrow in the upper-right corner of any screen, then click Choose Admin Rights – the user can then choose which unit they wish to access. This functionality is not applicable if emulating another FACULTY180 user. Previously, if a FACULTY180 user had administrative rights for more than one unit and wanted to switch the unit they were accessing, they had to log off, then log back on through the appropriate unit. Evaluation authors are now able to export evaluation forms to PDF and save them on your system, if this option has been configured by your institution. The option to allow an evaluation form to be exported to PDF is available on the Evaluation Form screen. In the Access to Results section, click Allow or Restrict for the Evaluators can export evaluation results after saving option. In the Perform Evaluations section, click Evaluate corresponding to the evaluation you wish to export. The View Faculty screen displays. To export an evaluation form to PDF, click PDF in the Export column. You are prompted to save the document as a PDF. Institutions can now specify if email messages sent from FACULTY180 via the Communication screen should be sent from the FACULTY180 administrator’s account, based on the unit level. Currently, all email messages sent via the Communication screen are sent from the account of the FACULTY180 user who is creating the message on the Communication screen. The beta version of the new activity input forms and associated workflow process is now available. This new process will allow institutions to create multiple activity input templates made up of one, some, or all input sections to collect and review faculty activities. If you are interested in being a beta tester for this new functionality, please contact us (melba@data180.com).